the blogging wagon in a bad way! There are about a half a dozen new posts begun to get me back on track, but after missing a year and a half, WHERE DO YOU START???! Things about me that are new since my last post... We found out that my youngest baby, L, suffers from severe life threatening food allergies. His allergies include Nuts, Milk, All Dairy, Eggs, and Wheat. 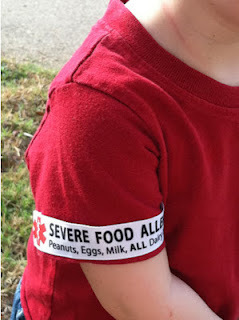 We have to keep a label on him at all times since some of his most severe allergens can be used as binding agents in emergency medications. I found a wonderful store on Etsy.com called Creative Clam that is run by really wonderful people. Tracey helped me design these ribbons for L and I sew them on the sleeve of each of his shirts. They wash great and transfer easily when he outgrows his clothes. Figuring out what to feed him was quite a challenge at first, but it was nice to know why he had been crying so very much at night. His little tummy just hurt all the time. We also had several close calls with anaphylactic reactions to nuts, milk, and egg. That's the only really big change for me, it altered the way we live life around here as you can imagine. We are all healthier for it though. anyone who loves crochet! Ok, here's my variation. When doing this stitch in the round, you have to chain 5 instead of 3 when starting the row of crossed treble crochets. The chain 5 counts as the first tc and ch1. You can see that the skirty increases in size as it comes down from the waist. 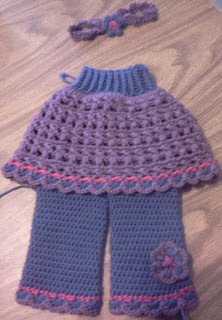 I did the increase on the row with the puff stitch. Between every other puff stitch I added an extra chain. Then on the row with the single crochet, I added one extra sc on each chain space that had an extra chain. It worked out perfectly. quite different when using a larger hook! Crochet is so awesome that way! It is so easy to change and adapt to whatever you want it to be by changing something as small as the hook size or how tightly you hold your thread! wagon and are completely nuts for the game. They have so much fun playing, and even more fun with the plush toys that we were given at Christmas time. So...I got this idea that I could make a hat for my youngest. 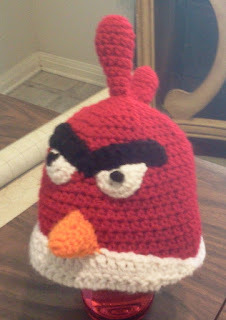 L has a special love for Angry Birds, so one night I just sat down and designed this hat out of my head. There are definitely a couple of changes that I'll make on my next one, but all in all I think it turned out really cute!! was a free pattern, but I can't seem to find a link for it. It was SOOO simple. 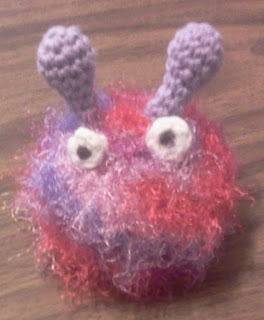 Just a basic round ball using 2 threads a regular yarn and an eyelash thread. The antennae and eyes are rather self explanatory. If you decide you want to make one and can't figure it out, just message me and I'll walk you through it. I added a tiny bit of gravel in the bottom to make it heavier and make it sound a little like a hacky sack when you move it around. It just turned out really cute!